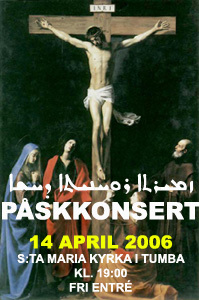 Passion and Easter are some of the most beautiful periods in our Syriac Orthodox church calendar. Church designed this period with wonderful prayers. Both lyrics and melodies were written in special forms to serve the liturgy in a good manner. Many of the church fathers wrote about the Lord’s passion and put significant melodies to their lyrics which our church preserved until now. The church fathers wrote many wonderful lyrical illustrations and described the passion of the Lord in an adorable style. Even the melodies were composed in a special structure to express the church’s sadness in this period. Syriacmusic choir could not leave this occasion without singing these wonderful hymns. During the last six months Syriacmusic choir was working intensively on preparing an Easter concert. In this Easter concert Syriacmusic choir will present hymns from the Holly Lent, Palm Sunday, the Nahiré ceremony, the Holly Supper and Good Friday. Hymns will be performed according to the ancient traditions of the Syriac Orthodox church and in their original form. This time we intended to have a reduced oriental orchestra to accompany the choir in order to emphasize the choir singing.